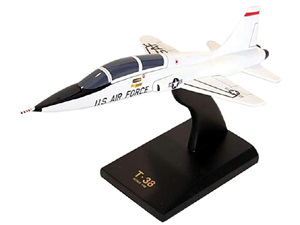 F-5 Tiger II Model Airplanes, Plastic Model Kits, Diecast Models, and Wooden Model Airplane kits. F-20 Tigershark Jet Fighter Military Aircraft Models. The F-5 freedom fighter was manufactured by Northrop Aircraft Company near San Diego. The F-5 Tiger Jet Fighter is 47' 2" long, 13' 2" high and has a wingspan of 25' 3". The empty weight was 10,567 lbs and the max gross weight was 25,145lbs. The F-5's used 2 General Electric J85-GE-21 jet engines each producing 3,500 lbs of thrust and with afterburner the engines produced 5,000 lbs of thrust producing a maximum thrust of 10,000 lbs. The F-5 Tiger has a max speed of 1,030 mph a cruise speed of 640 mph, climbed at 32,700 feet per minute and had a max range of 1,462 miles. The early F-5's, described above later evolved into the F-5G which used a single engine producing much more thrust and provided a less complex design. The F-5G was later called the F-20 Tiger Shark which was in direct competition with the General Dynamics F-16 Falcon. Since General Dynamics won the contract with its F-16 falcon the F-20 (F-5G) was never put into mass production and never saw service in our military. I once spoke to a head engineer about the F-20 Tiger Shark about why it didn't win the contract for production. He was reluctant to talk about this aircraft since its specs were very secret at the time, but he said the government wanted ever increasing performance and capabilities and a lower cost. Never the less, the F-16 won the contract and that is the plane which is seen in many services throughout the world. You can see the Yellow Airplane Kids Group visitation to see the F-16 at the 183rd Fighter Squadron by ing here. This 1/48 scale, plastic kit of a two-seat Northrup F-5F Tiger II supersonic fighter - used in both combat and as an "Aggressor" in training exercises - features a fully-equipped cockpit with optional-position canopies and a crew access ladder; cannon pods, Sidewinder missiles, and external fuel tanks; realistic exhaust nozzles; optional-position landing gear and speed brakes; a standing crew figure; a choice of VFC-111 "Sundowners" or 211 Squadron (RTAF) markings; and more. 11¾" long; 70 parts, skill level 3. Designed by Northrop, the F-5E Tiger II light fighter was exported to American allies during the Cold War and used by the U.S. military as training and aggressor aircraft. A replica of one of those Northrop F-5E Tiger IIs, this 1/48 scale, plastic kit features a well-equipped cockpit with a multi-part, glazed canopy; two Vulcan gun pods, two 2,000-lb. laser-guided bombs, and two AIM-9 Sidewinder missiles; an external fuel tank; separate speed brakes; realistic wheel wells and landing gear; and a choice of U.S. Air Force 58th Tactical Fighter Training Wing or U.S. Navy VFA-127 "Desert Bogeys" markings. You even get a standing pilot figure and a crew access ladder! Measures 11¾" long with a 6½" wingspan; 67 parts, skill level 2.
an F-5N Tiger II flown by the commander of the VFC-111 "Sundowners," a U.S. Navy Reserve adversary squadron based at Naval Air Station Key West, this 1/72 scale, die cast Hobby Master model features engraved panel lines; a well-equipped cockpit with an optional-position canopy and a removable pilot figure; premium details such as removable Sidewinder missiles and data sensors, optional-position landing gear, and a tail hook; and authentic markings, including shark's mouth nose art and the unit's famous "sunburst" tail art. Measures approximately 7¾" long with a 4½" wingspan and includes a display stand. A replica of a Northrop F-5E Tiger II that served as a trainer for U.S. and foreign aircrews visiting the 425th Tactical Fighter Squadron, 58th Tactical Fighter Training Wing, at Luke Air Force Base in the 1970s, this 1/72 scale, die cast Hobby Master model features engraved panel lines; a well-equipped cockpit with an optional-position canopy and a pilot figure; a full complement of arms, including Sidewinder missiles and laser-guided bombs; a removable, fuselage-mounted drop tank; optional-position landing gear; a tri-color camouflage scheme with authentic markings, including the Tactical Air Command emblem on the tail; and more. Measures approximately 7¾" long with a 4½" wingspan and arrives ready to display on the included stand. A replica of a prototype F-5E Tiger II that Taiwan designed in 2000/2001 to carry upgraded avionics and air-to-air missiles, this 1/72 scale, die cast Hobby Master model features engraved panel lines, a well-equipped cockpit with an opening canopy, removable missiles and a fuel tank, optional-position landing gear, realistic air intakes and exhaust nozzles, and the original's outstanding tiger paint scheme. Measures approximately 7¾" long with a 4½" wingspan and includes a display stand. a Northrop F-5E Tiger II that, leased from the Swiss Air Force, was flown by 2.Staffel/Fliegerregiment 2, Austrian Air Force, in 2004, this 1/72 scale, die cast Hobby Master model features engraved panel lines, a well-equipped cockpit with an optional-position canopy and a removable pilot figure, premium details such as removable fuel tanks and optional-position landing gear, and authentic markings. Measures approximately 7¾" long with a 4½" wingspan and includes a display stand. Made of Philippine mahogany, this 1/40 scale model measures 14½" in length and has a wingspan of 8¼". Hand painted and detailed, model comes ready to display on the included mahogany base. Made of precision molded plastic, this 1/48 scale model measures 11 ?" in length and has a wingspan of 5 ?". Hand painted and detailed, model comes ready to display on the included mahogany base. Made of Philippine mahogany, this 1/48 scale model measures 11 ¼" in length and has a wingspan of 5 ½". Hand painted and detailed, model comes ready to display on the included mahogany base. Made of Philippine mahogany, this 1/32 scale model of the "C" variant of the Northrop T-38 Talon - which, introduced in 1961, was the world's first supersonic jet trainer and is still flown by the U.S. Air Force - is hand painted and detailed, measures 17" long with an 8¼" wingspan, and includes a display stand. Made of Philippine mahogany, this 1/40 scale model measures 14?" in length and has a wingspan of 8?". Hand painted and detailed, model comes ready to display on the included mahogany base. Stu Shepherd. Wearing their familiar shark-mouth nose and "sunburst" tail art, U.S. Navy VF-111 "Sundowners" fighters - an F-4B Phantom II from the Vietnam War, a modernized F-5N Tiger II and an F-14A Tomcat from the late 1980s - race toward the setting Pacific sun. 24"x 18". The Tiger II was a lightweight jet fighter known for its maneuverability, two powerful engines, and ability to carry a high weapon load. Below are the variants of the T-38 Talon. N-156T : Northrop's company designation. T-38A : Two-seat advanced training aircraft the production model, 1139 Aircraft were built. T-38A(N) : Two-seat astronaut training version built for NASA. AT-38A : T-38As were converted into weapons training aircraft. DT-38A : US Navy T-38As which were converted into drone directors. NT-38A : T-38As were converted into research and test aircraft. QT-38A : Unmanned target drone aircraft. AT-38B : Two-seat weapons training aircraft. The T-38 was initially designed in the mid 50's as a trainer, a variation of the Northrop N-156 lightweight fighter project. The first prototype, designated the YT-38, flew on March 10, 1959. The first production models were made in 1961 with the entry into service on March 17, 1961. 1,187 T-38 trainers were built and it was estimated that about 50,000 military pilots have trained on this aircraft. Length 47' 2" 46' 4.5" 46' 6"
Height 13' 2" 12' 10.5" 13' 0"
Wingspan 26' 8" 25' 3" 26' 8"
Jet engines 2-General Electric J85-GE-21 2× General Electric J85-5A (J85-5R after PMP modification) afterburning turbojets 1× General Electric F404-GE-100 turbofan. Wing Loading 70 lbs/sq.ft. 81.0 lbs/sq.ft. Drag Area / Flat Plate Area 3.4 sq.ft.